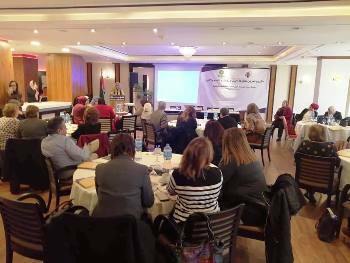 Ramallah – On December 11, 2018, MIFTAH and the “WIFAQ” Committee for National Reconciliation held a discussion session at the Grand Park Hotel on the national reconciliation files. Women and social leaders and members of the political elite attended the session in which three factsheets were presented that reflected the exclusion of women from the three reconciliation files: public freedoms, social reconciliation and the PLO, in MIFTAH’s efforts to include a Women Peace and Security agenda as part of the reconciliation discussions. MIFTAH worked with WIFAQ to develop factsheets on the three files, which were based on reliable data from MIFTAH reports and Human rights organizations that documented human rights violations and which focused on how this reality impacted Palestinian women during the period of political division; they were also based on in-depth meetings with communities in the West Bank (including Jerusalem) and the Gaza Strip. The session was considered a platform for sharing information and data on the developments within the three committees and to brief the participants on the obstacles and challenges facing these committees, which in turn stand in the way of achieving national reconciliation and ending the division. MIFTAH Executive Director Ibtisam Husary welcomed the guests, saying the goal of the session was to start a broadened dialogue including the various parties that represent Palestinian society at the political and social level. She also said that presenting the three factsheets was aimed at producing a position paper which includes recommendations for implementation at the decision-making and popular level in order to come out with visions of the women’s movement regarding ending the division and achieving national reconciliation. Husary continued that these factsheets are complementary to the detailed reports issued by MIFTAH which included documentation of violations against Palestinian women and girls’ rights during the division. One report focused especially on the violations at the social and security level regarding Palestinian women in the Gaza Strip. The first factsheet on public freedoms was presented by WIFAQ Committee member Maysar Atyani entitled: “Towards a policy vision to protect and promote public freedoms in light of the Palestinian division”. She discussed the findings of rights reports over the span of the division since 2007 in terms of the deterioration in the rights and public freedoms system due to the internal situation created by the division. The factsheet called for a policy framework of the necessary interventions for halting violations to public freedoms and rights, in relation to human security and dignity. In this regard, a number of alternatives were presented that would end the impacts of the division and its violation of citizens’ freedoms and rights in general and of women in particular, which include the following: adopting a group of urgent measures that respect public rights and freedoms of citizens; respect for the amended Palestinian Basic Law; treating the current dysfunction in the executive regulations for the executive authority to coincide with the principles of international legitimacy; separating humanitarian and rights issues from political action; adoption of a national/institutional plan to decrease assaults on public freedoms and rights through interventions that include protection and guidance, in addition to preventative interventions that target the system of laws and legislations associated with women’s rights in particular; to involve the popular base in defending public rights and freedoms to minimize the current violations to these rights and freedoms through a series of steps including: changing the work strategies in issues of awareness, advocacy and lobbying, promoting a culture of dialogue and popular symmetry through involving women and youth in showcasing and discussing their issues, in addition to promoting mechanisms of social protection and benefiting from the experience of the popular committees. WIFAQ Committee member Rana Da’ana also presented a factsheet entitled “The impact of the division on national and social reconciliation.” She addressed the repercussions of the conflict between Fatah and Hamas, which has harmed the core of the Palestinian cause and its national liberation project including the impact on its social structure, on the social fabric and on the initiatives and meetings that took place to end the division but reaped no results. In terms of the legislative, executive and judicial structures, the paper indicated that the division contributed to the development of two political contexts by the PA institutional leadership, one in the West Bank and the other in the Gaza Strip, each with different social, economic, cultural and legislative perspectives. It also contributed to two judicial and legislative contexts in the West Bank and Gaza. Meanwhile, this division had economic and social repercussions, manifested in rampant unemployment among youths and a rise in poverty rates in addition to its impacts on health, education and culture. This in turn had negative impacts on freedoms, the spread of violence, a rise in crime levels and social problems among families, especially since the past two years cast a shadow over women in particular, given that they are more exposed to hardships in the political and economic context. The factsheet identified several practical perspectives through a number of courses, including: adopting a qualitative and diversified women’s discourse that addresses various social sectors; calling for a gender perspective based on integrating gender in policies; shifting from reacting to the problem to actions taken on the ground; creating alliances that include the interests and perspective of marginalized and excluded sectors in the political and economic fields; investing in the various spaces and platforms available at the grassroots level to effectively mobilize the people and begin a process of accountability. The third file revolved around the PLO and was broached by WIFAQ member Rateeba Al Natsheh who presented a factsheet entitled “Reforming the PLO as a national necessity.” It included the problems and challenges faced by the PLO in terms of its setback in effectiveness, representation and the shrinkage of jurisdictions in favor of the PNA after the center of the Palestinian leadership moved into the occupied homeland. This has necessitated a call for restructuring the PLO as a basis for all Palestinians and in accordance with a collective political program that restores its prestige and momentum. The factsheet pointed to clearly insufficient representation of women over the years in the PLO, which was apparent in the representation of women in the PNC session in 1996, held in Gaza in which only 7.5% of the attendees were women. That is, 56 women of 730 members, while in 2018, the percentage rose to 10%. 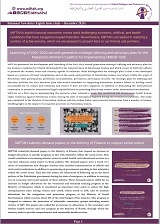 The factsheet also identified several issues that need to be addressed to lay the groundwork for a gender-sensitive policy framework, including: the problem of Palestinian representation, mostly political and rights representation; the future of the Palestinian national project; overlapping Palestinian institutional action; problems in decision-making and its mechanisms; vision, course and reference, and the course of reconciliation in the context of the PLO. During the session, the WIFAQ committee showcased a number of alternatives entitled “Effective national policies for reforming the PLO and for representing all Palestinians”. These included: holding periodic elections from the base to the Executive Committee and preparing a program for reforming and reviving the PLO as a unifying body for Palestinians inside the homeland and the Diaspora. The sessions included several presentations, including from Dr. Khalil Assaf, member of the freedoms committee. He commented on the first session on the public freedoms file, citing the ongoing efforts of the committee to hold meetings in order to discuss issues pertaining to these freedoms. It should be noted that the committee meetings in the West Bank convened separately from the committee meetings in the Gaza Strip and without broaching any issues pertaining to violations or to the promises to make a civil society institution a member of the public freedoms committee. The second presentation was given by Mr. Hani Al Masri, Director General of “Masarat” Center. He commented on the social reconciliation file, citing Hamas’ positions before the division when it propositioned itself as an equal and alternative to the PLO. Al Masri also criticized the Oslo Accords, which recognized the right of Israel to exist, which he said was completely different than realizing it as a state, given that the former is a blow to the Palestinians’ historical narrative. Al Masri warned of the repercussions of the division and its continuation on national unity, calling for this unity’s preservation. He also called for adherence to the rights of our people to self-determination and the right of return for refugees given that it constitutes the core of the Palestinian cause. He maintained that confronting the division and its repercussions calls for a reaffirmation of the social contract in the Palestinian National Charter, an agreement on the foundations and goals we seek to achieve and the means of achieving them. Al Masri stressed on the role of women and civil society and on the importance of elections, all of which are issues that require pressure from everyone until the ultimate goal is achieved of establishing a democratic Palestinian state that embraces political pluralism and a genuine opposition. In his presentation, PLO Executive Committee Secretary Saeb Erekat commented on the reformation of the PLO, differentiating between two current projects in the Palestinian arena today. The first, he said was the national project, led by the PLO, which abides by international legitimacy and human rights, and the factional, religious project that believes the Gaza Strip is the gateway to an Islamic state. He pointed out that Hamas began to break away from the PLO when it refused to join the national unity leadership in 1988 and worked alone outside the framework of this leadership. The presentations of the women leaders who participated reaffirmed the role of Palestinian factions and civil society institutions in combatting gender and class exclusion, which casts a shadow over Palestinian society and the Palestinian political system. They said this has manifested itself in society’s polarization and fragmentation, stressing on the need to take serious joint steps to stand up to the division and preserve the national project. 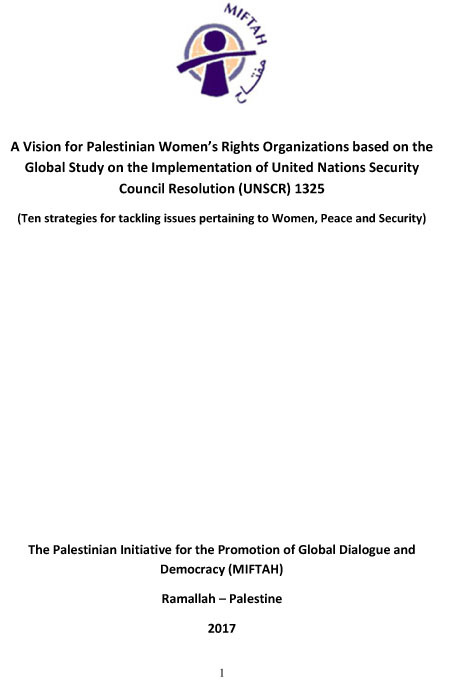 The recommendations also called for an agreement on a unifying national project; reconsideration of the sanctions imposed on the Gaza Strip; respect for rights and public freedoms in the West Bank and Gaza Strip; allowing the women’s narrative the necessary space for pressuring both sides of the division; demanding the PLO to carry out its role in accountability; reviving the role of the various factions and parties in this regard; calling for the review of a unified policy based on true political partnership; amending the mechanism for national action to be based on dialogue. WIFAQ is a national women’s initiative that seeks to include the women’s agenda on the table of national dialogue as a priority and to boost public awareness on national reconciliation and on ending the political division. It includes several women cadres from the West Bank and Gaza whose vision coincides with that of the Palestinian women’s agenda for peace and security. The committee was formed by MIFTAH in 2016 as part of its OXFAM-funded interventions within the Conflict and Fragility project to promote women’s participation in peace and security.